I'll admit it: I am endlessly fascinated by the late David Foster Wallace. I am also a big fan of Jonathan Franzen's work, including his most recent novel, Freedom. So imagine my excitement when I opened the latest edition of The New Yorker and discovered Franzen's article, "Farther Away," which recounts his trip to the archipelago that inspired Daniel Defoe's famous novel, Robinson Crusoe, a bruising, beautiful wilderness where Franzen hoped to reclaim some measure of solitude after the post-Freedom juggernaut, carve out a space to grieve his dead friend, and ruminate on the novel's evolution from a totem of human individuality to the cultural enabler of our present-day addiction to entertainment. It was also, as it turns out, a place where he could sift through the metaphorical ashes of his old friend (in addition to scattering some real ones), before letting the winds of the South Pacific blow them all the way back to the offices of The New Yorker. So what does Jonathan Franzen do? He summons all the psychological acuity he's so well regarded for to perform an impressive, if fairly lacerating, autopsy of his old friend. He begins, though, by saying many nice things. It is evident he cared deeply for Wallace, that he admired his work enormously. It is also acknowledged that they enjoyed a rivalry of sorts, a very male competition that likely made the both of them better writers. For my part, I find it entirely understandable that Franzen feels angry at Wallace, and more isolated than ever, after leaving him to bear the mantle of Literary Legend alone. But beneath all of that--I most sympathize with him for not having Wallace around when he just wants to pick up the telephone and talk, be it about Wallace's dogs, Franzen's birds, or yes, whether Robinson Crusoe ushered in the age of fictional verisimilitude or not (I, alas, must simply take Franzen's word on this). Anyone who's been scarred by suicide understands this wrenching sense of injustice and betrayal. The person we loved did not love us enough to stick around. They left us memories, but slashed the darkest of wormholes towards returning to them. My husband's cousin--who was more like a brother to him--killed himself four days after Wallace did. Their deaths are inexorably linked in our minds, which likely goes a long way toward explaining why this piece touched a nerve with me. Something in me still shudders when recalling Paul's face and voice from that day. In the weeks that followed, we recycled the "why?" questions over and over again, until they finally exhausted themselves in a heap of cinders. It's futile to ask the question, when the answer is so irrational. And so permanent. At some point, you have to bury the need to know under the love you felt for the person, and get on with the business of living. The only truth worth arriving at is: it wasn't really about me. And so, being left behind means letting go of your own narcissism to grant someone the unknowable terrain of their pain and the freedom to say goodbye. I imagine the side of David that advocated going the Kurt Cobain route speaking in the seductively reasonable voice of the devil in "The Screwtape Letters," which was one of David's favorite books, and pointing out that death by his own hand would simultaneously satisfy his loathsome hunger for career advantage and, because it would represent a capitulation to the side of himself that his embattled better side perceived as evil, further confirm the justice of his death sentence. Yes, you can imagine that. Funny how the "imagine" part dissolves under the stuff that follows. The stuff about your friend killing himself to remain the alpha dog. He dangles this information for us, too: that instead of the suicide being an act of reckless impulsivity, Wallace made four "practical plans" for it in the summer before his death. Ever the discriminating novelist, Franzen leaves it for the reader to fill in the specifics of these mysterious "plans." The effect is twofold: his superior knowledge of the situation cements his standing as an intimate to Wallace and his widow (there were four plans: what a very specific number), while his refusal to say what these plans were might be smoothly interpreted as one friend respecting the privacy of another. This would be more believable if he hadn't spent a couple pages speculating--by way of literary analysis and personal inference--about that friend's curdled state of mind, under the buttery, almost self-congratulatory mantle of "setting the record straight." After all, Franzen and Wallace weren't about illusions, but the reality of what those illusions mask. What is friendship, when Truth is imperative? And who better to question Wallace's increasing personal canonization in literary circles than a trusted friend. He knew him as well as anyone, after all. Yet I wonder if it didn't occur to Franzen, while writing this, how often his own fictional characters conceal themselves, especially from the people they love most. What a shifty prey one's personal truth becomes, hanging out in the shadows, massaging our thoughts and actions from the inside out while we fumble for our social footing. What utter hubris to think you can dissect someone's torment and hold Truth aloft in your hand like a trophy you've won. When Franzen finally tosses a portion of Wallace's ashes off the cliffs of Crusoe's island, he writes, "I felt done with anger, merely bereft, and done with islands, too." But no, he went on to write about it, in a magazine read by millions. And when push comes to shove, this strikes me as just being not a very nice thing to do. Grief is ugly and real--and all too gut-wrenchingly universal--but grief is also infinitely unique and personal. By all means, channel that grief into your art, let it find some soil to take root--becoming the sleight-of-hand verisimilitude only your experiences could grow--but let the dead friend remain your friend; nothing more or less. Don't go adding to the cult of celebrity you supposedly abhor. Don't go attaching yourself to it. There is no last word to get in. The man is not here to respond. And he never can. His new novel is here, however. David Foster Wallace's The Pale King--a Literary Event even in its unfinished state--was published last week. The same week that Jonathan Franzen's article was printed in The New Yorker. Funny timing, yeah? Man escapes the promotional limelight of his own book to travel to a remote, deserted island with the ashes of his friend, only to come back and make himself part of the friend's story and limelight. You couldn't write this stuff. Okay, here's the thing: I know I'm being harsher on Franzen than I have any real right to be. I didn't throw down the article in frustration; I read it quickly through to the end. Voraciously, even. And I'm performing my own lengthy postmortem on it here. I guess if grief is truly personal, then it has an infinite number of incarnations. Who am I to say he's doing it wrong? All I know is that after reading the article, I felt a little compromised and disgusted with myself. Franzen talks a lot about our culture's saturation in entertainment and The Self, and how entwined those two things have become, thanks to the internet. How is publishing such a sensational article in The New Yorker--an article you could only read on-line by "liking" The New Yorker fan page on Facebook--any different, when push comes to shove? I get the feeling Franzen wants to feel superior to all of that popular nonsense, when really, he's slumming like the rest of us. 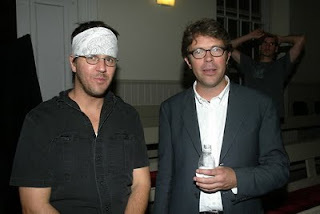 Ultimately, I suppose, the article just struck me as being unworthy of Franzen's work, which I truly love, and more importantly, unworthy of a friendship that didn't need to be written, because it was lived. I'd like to believe that some kind of loyalty endures, even after the fact. That we let go because we have to, but that we keep the most precious parts of the people we loved. On an island so remote, yet sacred, that no one else can fully tread there. One of my favorite quotes is this gem from John Keats: "I am certain of nothing but the holiness of the heart's affections and the truth of imagination." Maybe we all should endeavor, through self awareness and humility, not to overly confuse the two.